If you’ve been following my blog for a while, you will know that I am obsessed with all things Chickpea Flour. From savoury muffins, to pancakes and banana bread, I thought I had discovered all of the joys of chickpea flour… until now. Also known as Gram flour or Besan, Chickpea flour is essentially a flour made from dried and milled chickpeas. That’s it. Why do I love Chickpea flour? It is the perfect replacement for eggs. It can be used to make omelette’s, fritatta’s, quiche’s, “egg“ muffins and so much more. This is great for vegans or people with egg allergies. It’s high in protein, fibre, magnesium, iron and b-vitamins and almost fat free. So in a way, it’s nutritionally superior to eggs. Unlike whole legumes, chickpea flour is easy on the digestion. So for anyone with IBS or anyone who suffers from gas/ bloating when eating beans, this is a great way to get those legumes in without the tummy upset. Okay, enough about Chickpea flour. Now on to this dish: The Vegan Fritatta. 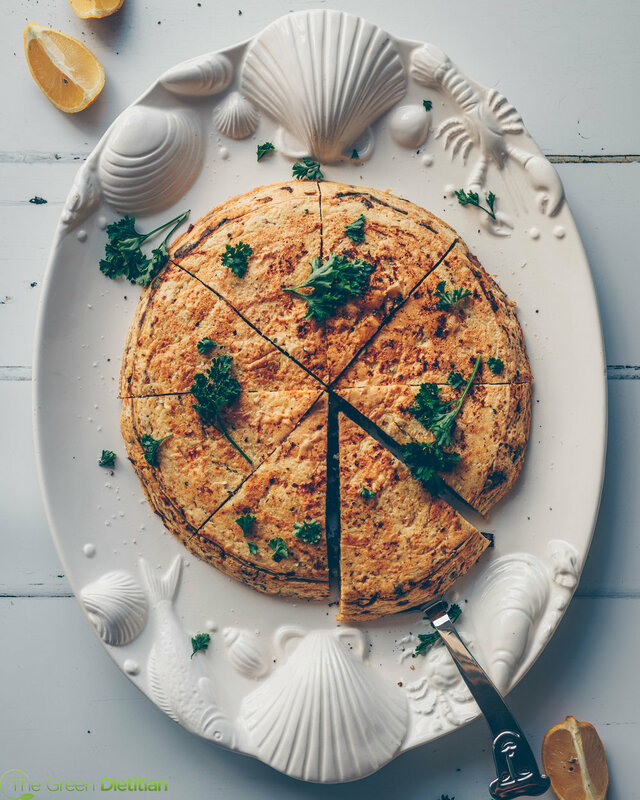 This dish makes 8 filling, high protein quiche-like slices and is also packed with veggies for that extra micronutrient kick. It’s great for meal prep: make it on a Sunday and keep it in the fridge for the week. It’s easy to transport and great to add to lunch boxes for work or school. And lastly, it’s a major crowd-pleaser. Have some friends over for brunch and watch them drool. 1. Combine the dry ingredients for the batter in a large mixing bowl. 2. Slowly add the water into the dry ingredients, whilst stirring until a thick paste is formed. Then pour in the remaining water and stir through. The batter should be the consistency of beaten eggs. Remember, that if you add the water all at once, the batter will become clumpy so make sure to pour slowly whilst stirring. 3. Set your batter aside whilst you prepare your filling. 4. Heat your olive oil in a pan and add the chopped onion. Fry your onions for 3 minutes. Next, add the diced mushrooms, asparagus and vegan polony and fry until the mushrooms are well cooked. Add salt and pepper to taste. Set the filling aside. 5. For the fritatta you will need a large deep non-stick pan or dutch oven with a lid. Heat your pan on medium heat with 1 tsp of olive oil to prevent sticking. 6. Mix 1/2 the cooked filling into the batter and pour the mixture into your heated pan. Allow it to cook with the lid off for about 3 minutes or until the batter starts to stiffen slightly. Then add your remaining filling evenly throughout the pan. The filling should sink slightly into the batter. 7. Place the lid over your pan and allow the batter to cook for about 7-10 minutes. The fritatta is cooked through when the batter becomes springy to the touch. Remember to keep the heat low-medium throughout cooking so that the batter doesn’t burn at the bottom. You can also place your pan under the grill in your oven (lid off) to get the top to cook through. 8. Once cooked through, allow the fritatta to cool slightly in the pan before turning it out into a serving dish. Cut into 8 slices and serve warm.